This extraordinary dish is sure to create a splash at your next dinner. The polished aluminum bowl takes the familiar form of a rowboat, complete with "wooden" planks cast along its hull. The boats oars are a pair of serving tools, carved from sheesham, a variety of rosewood which is renowned for its intricate, marbled grain. 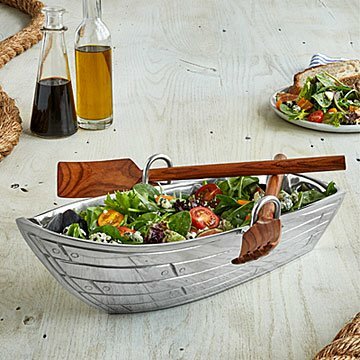 Whether you're serving salad, holding fruit, or simply putting it on display, this bowl is sure to make waves. Made in India. Handwash, dry with soft cloth. Loved it so much, I got 2!!! My Dad LOVED This Gift! I use uncommongoods all of the time for elegant, unique client gifts and so when the holidays came around I decided to look for my family. My parents have high standards and they were very pleased with this beautiful serving dish and jumped up to find a place to display it as soon as they unwrapped it. Out of everything I got for them this year this was by far their favorite gift! Loved the look o the internet and loved the actual product even more! Bought as a gift, they loved it as soon as they opened it! Perfect gift for two family members who have everything! I bought two of these for family members, but have not actually seen the product. Thus I cannot speak about the quality of the product. However the two to whom I sent the item were thrilled with the Row Boat and couldn't wait to use it. We have friends who would love to eat salad and live on water. What could be a more perfect gift? This is a sturdy piece so perfect for dislay, a little heavy to pass around the table but not a deal breaker to me.